The decision by Eta, the Basque armed nationalist organisation, to declare a unilateral, unconditional and open-ended ceasefire last weekend provides another opportunity for the last remaining armed struggle in western Europe to be brought to a negotiated, peaceful conclusion. This is the third time in 12 years that Eta has called a cessation. The opportunities provided by earlier movement were neither fully grasped,developed nor exploited to their full potential. That fact that Eta was moved to make a third ceasefire declaration is a measure of its commitment to finding a peaceful way forward to Basque independence while dealing with the issues that fuelled the 50 years armed conflict during which almost 800 people lost their lives and thousands of political prisoners were imprisoned. It will not come as a surprise to the leadership of Eta or the political leaders of the banned Herri Batasuna - the party closest to Eta - that the Spanish government’s response to the ceasefire announcement was insulting and offensive. Both organisations will have calculated that to be the case long before Eta’s declaration yet Eta was not deflected from its course of action. That in itself is an indication that this time Eta is acting in the interests of the people of the Basque nation and may well be guided by their mood rather than the self-serving political agenda swirling around the corridors of military and political power in Madrid. But whatever this particular Spanish government might say officially or unofficially about Eta’s decision last weekend, it knows that it has to seek a political solution to the Basque Question. 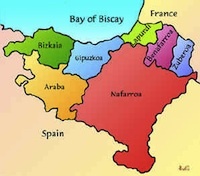 it knows that successive Spanish governments, including Franco’s dictatorship, failed to suppress the demand for national self-determination in the Basque country. The Spanish state has used all the resources of repression available to it: executions, torture, imprisonment, bans on political parties, newspapers and media outlets in its attempts to quell Basque resistance. Spanish democracy itself,post Franco, is corrupted by the failed measures taken to weaken Basque nationalism. The Spanish government now has a chance to restore the core values of a modern social democracy to Spain by engaging in both the letter and the spirit with which Eta penned its ceasefire announcement. It would be an appropriate moment for the Spanish government to announce it is lifting the ban on Herri Batasuna and on newspapers and media sympathetic to it. In particular Arnaldo Ortegi, the imprisoned Basque leader should be released. He has been a steadfast champion of both Basque rights and the need for a peace process. It would also be a huge confidence boost for the incipient peace process for the Spanish government to introduce measures to improve the conditions in which political prisoners are held and visited by their relatives, until the prisoners are released. There is no political principle involved for the Spanish government not to be open and practical in its response to Eta’s announcement. There is at least a 25-year history of direct talks between representatives of the Spanish government and Eta. There is a long standing and close relationship between the independence movements in the Basque country and Irish republicans. For most of the past decade Herri Batasuna (HB) representatives have met Sinn Fein representatives to exchange experiences of moving out of armed conflict. Sinn Fein’s approach to HB was similar to the approach taken by the African National Congress (ANC) who gave great assistance to Sinn Fein in the early days of the peace process here. The ANC have also been involved in the Basque situation. Sinn Fein president Gerry Adams welcoming Eta’s decision said: “This is a significant statement and has the potential to bring about a permanent end to the long-running conflict in the Basque country. It is now vital that the Spanish government respond positively and grasp the opportunity to advance a peace process presented by (Eta’s) announcement and quickly establish inclusive political negotiations.” The primary lesson from the peace processes in South Africa and Ireland - and the Spanish government would do well to study both - is not to impede progress by erecting preconditions. Such tactics will smother the optimism of the moment and bog progress down in endless whataboutery.